Prepare for your organization’s future by gaining practical knowledge at Maximize, NAA’s annual conference for asset and revenue management. Join us in Atlanta from September 23-24! NAA has released a white paper for property owners and managers to effectively improve package management within rental housing communities. It tackles the pros and cons of various management systems that save you time, increase revenue and protect liability. Join us at Apartmentalize as our General Session speakers, Mindy Kaling and Laila Ali, provide uplifting perspectives to help you see your work from a new angle! Advance your rental housing career and save 20% on maintenance and property management courses on Visto in April! 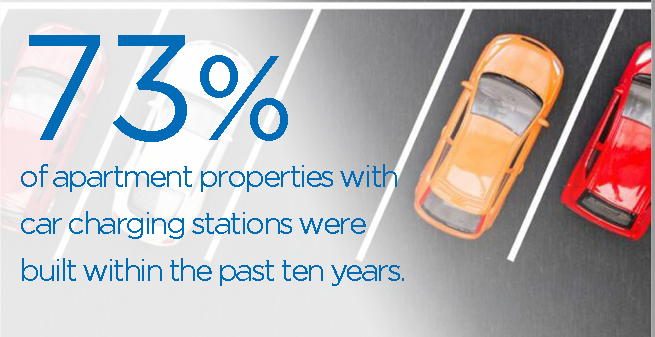 The number of newly constructed apartment properties with car charging stations steadily increased through much of this decade. This trend is expected to continue given the surge in mainstream popularity of electric vehicles. Read "The Transformation of Parking" for more industry trends. As the flagship publication of NAA, units Magazine is a full-color trade publication featuring news and newsmakers in the apartment housing industry. NAA's award-winning blog showcases featured bloggers from all sectors of the apartment industry covering Economic Issues, Green Issues, Marketing, Operations and more. Several NAA staff also blog about their respective subject matter as an added benefit to the readership. The National Apartment Association publishes a variety of digital e-newsletters and regular postings discussing multiple topics ranging from the latest trends in technology and marketing to highlighting key viewpoints in industry public policy. April is the month for rental housing professionals to celebrate, show off your work and encourage job-seekers to start careers in residential property management (RPM). Follow RPM Careers on Instagram and start spreading the word about your #RPMmoments! The NAA Income and Expenses Survey is the most comprehensive look at apartment housing operations data available. With detailed local market and national economic analysis, it gives apartment operators the financial tools they need to measure their performance against their peers. NAA can provide you with many membership benefits, such as education courses, informational newsletters and/or magazines, and opportunities for networking at conferences. NAA offers a unique blend of membership services that can include opportunities for career enhancement, volunteer leadership and community involvement. Putting you in touch with excellence and reliability at significant savings—that’s what Open Door is all about. That and the purchasing power of 68,000 NAA members buying as one. Open Door purchasing is included in your NAA membership. What do you like and dislike about the new website?